Castor & Pollux set new standards with the introduction of complete lines of organic and responsibly sourced pet food. Castor & Pollux needed to communicate their continued improvement of their product offerings. They challenged Enlisted to refresh Organix packaging, now made with 95% certified ingredients. And create Pristine, made with with responsibly sourced ingredients. Tasked to reach for a simple and natural aesthetic, Enlisted explored a food forward approach to the visuals and revisited the information organization, making it easier for pet parents to understand the benefits and the quality of ingredients. The visuals focused on delicious ingredient compositions, and took benefit messaging to the next level. Pristine was launched to carry the message around the carefully selected ingredients that appeals to pet parents who care deeply about providing their pets with the best quality food. Enlisted explored visuals focused on the landscape imagery, providing consumers a window into the setting where the exceptional and safe ingredients were raised. 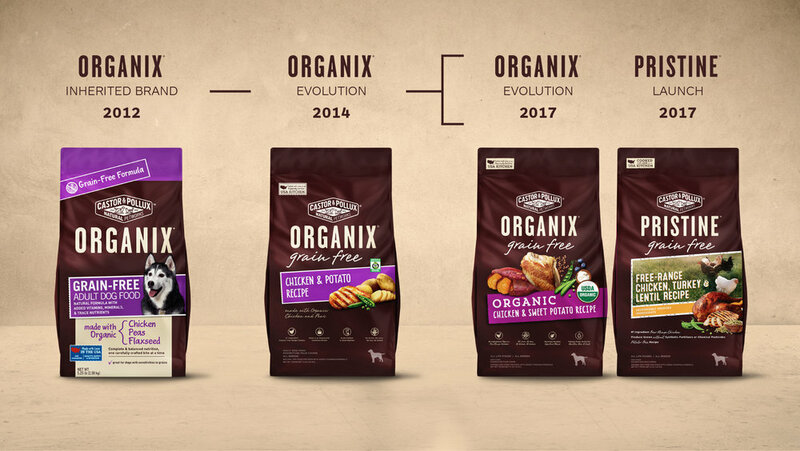 Organix and Pristine are the only complete lines of pet food of their kind.